Paris Saint-Germain defender, Marquinhos has spoken out in defence of criticism faced by his team-mate, Neymar. 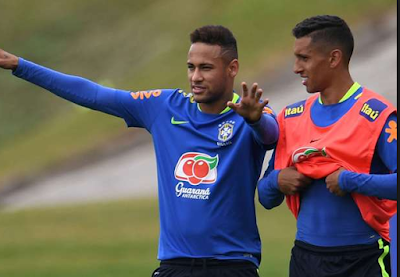 Marquinhos dismissed concerns over Neymar’s temperament insisting it’s impossible for the forward to please everyone. Neymar has been on the headline since his high-profile switch from Barcelona to the French capital. “For everything Neymar has been doing on the pitch, whoever thinks he’s not [performing as expected] must be watching another game. He’s a different player, a star, someone who instantly becomes a target for other players, for the press and fans,” said Marquinhos. “Just like all the other great players, [opinion] will never be unanimous. There will always be those who do not like him, and others who admire him. “It’s important is to have character…Neymar has a good head on his shoulders, is very important for Brazil and we are all trying to help with his adaptation in Paris.